Victor Umeh of the All Progressives Grand Alliance (APGA) who won last week’s senatorial elections in Anambra state has been sworn into office as the senator representing Anambra central. Willie Obiano, governor of Anambra state, and members of the state House of Assembly were in the upper chamber to witness the swearing-in of Umeh on Thursday. In December 2015, Uche Ekwunife of the Peoples Democratic Party (PDP) was sacked by the Appeal court following an appeal brought to it by Umeh. The court ordered a rerun election which took place on Saturday. The polls held in seven local government areas; Njikoka, Awka north, Idemili south, Dunukofia, Awka south, Anaocha and Idemili north. 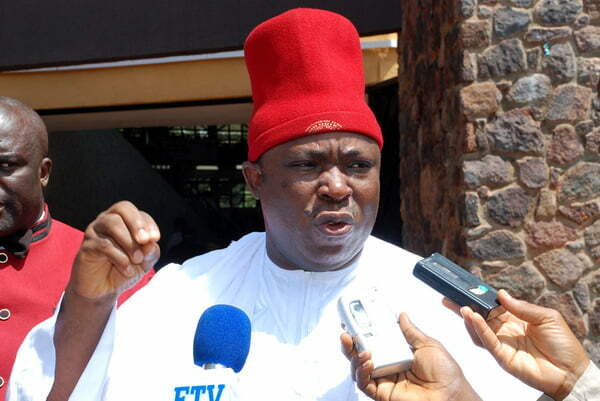 Umeh polled 64, 878 votes, roundly defeating the All Progressives Congress (APC) candidate who came second with 975 votes . The Progressive Peoples Alliance (PPA) came third with 116 votes. Anambra Central Senatorial district had been without a representative for close to two years now.